Not to be confused with Cresyl violet. Crystal violet or gentian violet (also known as methyl violet 10B or hexamethyl pararosaniline chloride) is a triarylmethane dye used as a histological stain and in Gram's method of classifying bacteria. Crystal violet has antibacterial, antifungal, and anthelmintic properties and was formerly important as a topical antiseptic. The medical use of the dye has been largely superseded by more modern drugs, although it is still listed by the World Health Organization. A number of possible routes can be used to prepare crystal violet. The original procedure developed by the German chemists Kern and Caro involved the reaction of dimethylaniline with phosgene to give 4,4′-bis(dimethylamino)benzophenone (Michler's ketone) as an intermediate. This was then reacted with additional dimethylaniline in the presence of phosphorus oxychloride and hydrochloric acid. When dissolved in water, the dye has a blue-violet colour with an absorbance maximum at 590 nm and an extinction coefficient of 87,000 M−1 cm−1. The colour of the dye depends on the acidity of the solution. At a pH of +1.0, the dye is green with absorption maxima at 420 nm and 620 nm, while in a strongly acidic solution (pH −1.0), the dye is yellow with an absorption maximum at 420 nm. The different colours are a result of the different charged states of the dye molecule. In the yellow form, all three nitrogen atoms carry a positive charge, of which two are protonated, while the green colour corresponds to a form of the dye with two of the nitrogen atoms positively charged. At neutral pH, both extra protons are lost to the solution, leaving only one of the nitrogen atoms positive charged. The pKa for the loss of the two protons are approximately 1.15 and 1.8. Crystal violet is not only used as a textile dye, but also it is used to dye paper and as a component of navy blue and black inks for printing, ball-point pens, and inkjet printers. It is also used to colourize diverse products such as fertilizers, antifreezes, detergents, and leather. 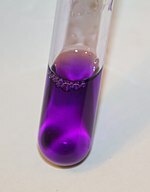 When conducting DNA gel electrophoresis, crystal violet can be used as a nontoxic DNA stain as an alternative to fluorescent, intercalating dyes such as ethidium bromide. Used in this manner, it may be either incorporated into the agarose gel or applied after the electrophoresis process is finished. Used at a 0.001% concentration and allowed to stain a gel after electrophoresis for 30 minutes, it can detect as little as 16 ng of DNA. Through use of a methyl orange counterstain and a more complex staining method, sensitivity can be improved further to 8 ng of DNA. When crystal violet is used as an alternative to fluorescent stains, it is not necessary to use ultraviolet illumination; this has made crystal violet popular as a means of avoiding UV-induced DNA destruction when performing DNA cloning in vitro. In biomedical research, crystal violet can be used to stain the nuclei of adherent cells. In this application, crystal violet works as a intercalating dye and allows the quantification of DNA which is proportional to the number of cells. Gentian violet has antibacterial, antifungal, antihelminthic, antitrypanosomal, antiangiogenic, and antitumor properties. Treating impetigo; it was used primarily before the advent of antibiotics, but still useful to persons who may be allergic to penicillin. In resource-limited settings, gentian violet is used to manage burn wounds, inflammation of the umbilical cord stump (omphalitis) in the neonatal period, oral candidiasis in HIV-infected patients and mouth ulcers in children with measles. Because of its antimicrobial activity, Gentian violet could be used for treatment of skin and eye infections in livestock, and ich in fish. However, it is not accepted for use in aquaculture in most developed countries. The name "gentian violet" (or Gentianaviolett in German) is thought to have been introduced by the German pharmacist Georg Grübler, who in 1880 started a company in Leipzig that specialized in the sale of staining reagents for histology. The gentian violet stain marketed by Grübler probably contained a mixture of methylated pararosaniline dyes. The stain proved popular and in 1884 was used by Hans Christian Gram to stain bacteria. He credited Paul Ehrlich for the aniline-gentian violet mixture. Grübler's gentian violet was probably very similar, if not identical, to Lauth's methyl violet, which had been used as a stain by Victor André Cornil in 1875. "Like MG [malachite green], CV [crystal violet] is readily absorbed into fish tissue from water exposure and is reduced metabolically by fish to the leuco moiety, leucocrystal violet (LCV). Several studies by the National Toxicology Program reported the carcinogenic and mutagenic effects of crystal violet in rodents. The leuco form induces renal, hepatic and lung tumor in mice." Engineering students in Canada use gentian violet to dye their skin and jackets, a tradition started in honour of World War 2 Naval Engineers whose purple armbands would leave their skin dyed after countless days spent in the boiler rooms. ^ Hodge, H. C.; Indra, J.; Drobeck, H. P.; Duprey, L. P.; Tainter, M. L. (1972). 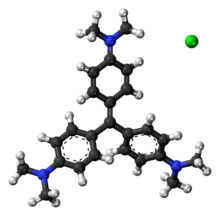 "Acute oral toxicity of methylrosaniline chloride". Toxicology and Applied Pharmacology. 22 (1): 1–5. doi:10.1016/0041-008X(72)90219-0. PMID 5034986. 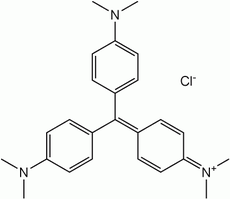 ^ Thetner, D. (2000), "Triphenylmethane and related dyes", Kirk-Othmer Encyclopedia of Chemical Technology, Wiley . Also available from Scribd Archived 2012-11-04 at the Wayback Machine. ^ a b Adams, E. Q.; Rosenstein, L. (1914). "The color and ionization of crystal-violet". J. Am. Chem. Soc. 36 (7): 1452–1473. doi:10.1021/ja02184a014. ^ Klingenberg, Marcel; Becker, Jürgen; Eberth, Sonja; Kube, Dieter; Wilting, Jörg (2014-04-06). "The NADPH Oxidase Inhibitor Imipramine-Blue in the Treatment of Burkitt Lymphoma". Molecular Cancer Therapeutics. 13 (4): 833–841. doi:10.1158/1535-7163.mct-13-0688. ^ Maley, Alexander M.; Arbiser, Jack L. (Dec 2013). "Gentian Violet: a 19th century drug re-emerges in the 21st century". Experimental Dermatology. 22 (12): 775–780. doi:10.1111/exd.12257. PMC 4396813. PMID 24118276. ^ Gorgas, Ferdinand J. S. (1901), "Pyoctanin – Methyl-Violet – Pyoctanine", Dental Medicine. A Manual Of Dental Materia Medica And Therapeutics, 7th edition, chestofbooks.com, archived from the original on 2011-03-15, retrieved 2011-03-15. ^ Choudhary, KN; Soni, PP; Sao, DK; Murthy, R; Deshkar, AM; Nanda, BR (April 2013). "Role of gentian violet paint in burn wound management: a prospective randomised control trial". J Indian Med Assoc. 111 (4): 248–50. PMID 24475556. ^ Qamar, FN; Tikmani, SS; Mir, F; Zaidi, AK (Nov 2013). "Community-based management and outcome of omphalitis in newborns in Karachi, Pakistan". JPMA. The Journal of the Pakistan Medical Association. 63 (11): 1364–9. PMID 24392520. ^ Jurevic, RJ; Traboulsi, RS; Mukherjee, PK; Salata, RA; Ghannoum, MA; Oral HIV/AIDS Research Alliance Mycology Focus, group (May 2011). "Identification of gentian violet concentration that does not stain oral mucosa, possesses anti-candidal activity and is well tolerated". European Journal of Clinical Microbiology & Infectious Diseases. 30 (5): 629–33. doi:10.1007/s10096-010-1131-8. PMC 3076549. PMID 21210170. ^ ‹See Tfd›US 290893, ‹See Tfd›Kern, A., "Manufacture of dye-stuff or coloring-matter", issued 1883 ; Also available from Google. Wikimedia Commons has media related to Crystal violet.